Schubert’s ingenious ‘Wanderer’ Fantasy, given on a Graff model from the early-1830s, enjoys clarity and perhaps more attack and colour than might be expected. What an interesting and, in the auditioning, persuasive idea – to play four great piano works on different instruments, each contemporary to the music’s genesis (well, almost). 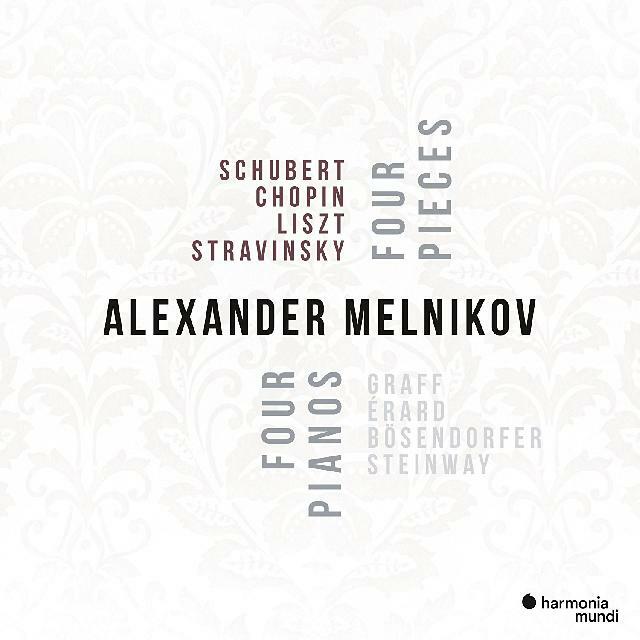 Not that the novelty should disguise Alexander Melnikov’s musicianship, for he brings to each choice superb technical resource to serve his considered interpretations. Thus Schubert’s ingenious ‘Wanderer’ Fantasy, given on a Graff model from the early-1830s, enjoys clarity and perhaps more attack and colour than might be expected, and the lucidity of an 1837 Érard benefits Chopin’s opus 10 Studies, freshly-minted by Melnikov. He goes on to give stunning accounts of finger-twisting creations, Liszt’s Réminiscences de Don Juan (Mozart’s Don Giovanni) on a rather wonderful-sounding 1875 Bösendorfer, and Stravinsky’s Three Movements from Petrushka, for which a new (2014) Steinway is wheeled in for its contemporary stamp; perfectly fine, but would not a manufacture from the 1920s have been more appropriate? Excellent recording and presentation.